Much has been learned about how to prepare healthful foods that are enjoyable, convenient to make, and economical. Many of the leading chefs of Europe and the United States have abandoned cooking styles that once depended on fats and oils and are now using healthier cooking methods. This "new" cuisine uses the cook's culinary skill to create delicious meals that bring fruits, vegetables, and grains to center stage. 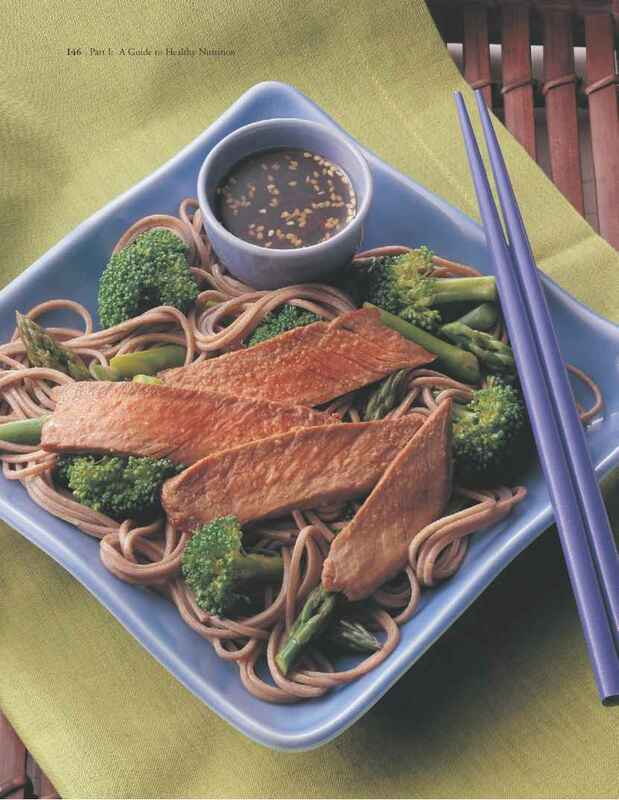 Simple yet innovative techniques can be used to modify favorite recipes to maximize the nutritious value of the meal without jeopardizing its taste. When you modify an existing recipe, it is generally best to start slowly, making one change at a time. Persistence, willingness to experiment, and a few tried-and-true hints can help you prepare healthful and flavorful meals. Recently, fat, sugar, and salt have been vilified for they play in increasing the risk of certain diseases such as obesity, diabetes, coronary artery disease, and high blood pressure. However, they are only "bad" when eaten in excess. The key is not to banish them from the kitchen but to use them in moderation. Fat provides flavor, substance, and a mouth-pleasing creamy texture. Sugar adds sweetness, crispness, tenderness, and color. Salt heightens the flavor of foods and is necessary in baked goods made with yeast. The art of cooking is to put the proper amounts of these ingredients in each food. Recipe modification is one of the more useful cooking skills. In some instances, modification of the fat, sugar, or salt content actually can make the food tastier, moister, and more satisfying than it was originally. When Should a Recipe Be Modified? Keep in mind that not every recipe needs to be modified. If, for example, a certain high-fat dessert is a family favorite and it is prepared infrequently, there is no need to change it. As long as it is treated as an item from the top of the Food Guide Pyramid (see Chapter 1, page 11)—the occasional food—enjoy it in its familiar form. Because every recipe is different, experimentation is necessary. There are numerous ways to make a recipe healthier. Of course, not every experiment works. It may take several attempts to achieve the desired taste and consistency. Once the modified recipe meets your expectations, file it for future use. 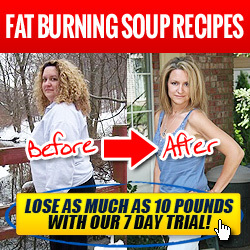 • Delete a high-fat ingredient or seasoning. • Substitute a healthier ingredient. • Change the method used to prepare the recipe. • Reduce the amount of meat in the recipe. Can the Amount of an Ingredient Be Reduced? Start by reducing the amount one ingredient at a time. In most baked goods, sugar generally can be reduced by one-third to one-half without substantially changing consistency or taste. Because sugar increases moisture, as a rule retain one-fourth cup of sugar, honey, or molasses for every cup of flour in baked goods. To maximize the sweetness of foods, when appropriate, serve the dish warm or at room temperature rather than cold. In addition, there are spices that can enhance sweetness. Some possibilities include cinnamon, cloves, allspice, nutmeg, and vanilla and almond extract or flavoring. Eliminating a cup of sugar in a recipe saves about 800 calories. Fat also can be reduced by one-third to one-half in baked goods. 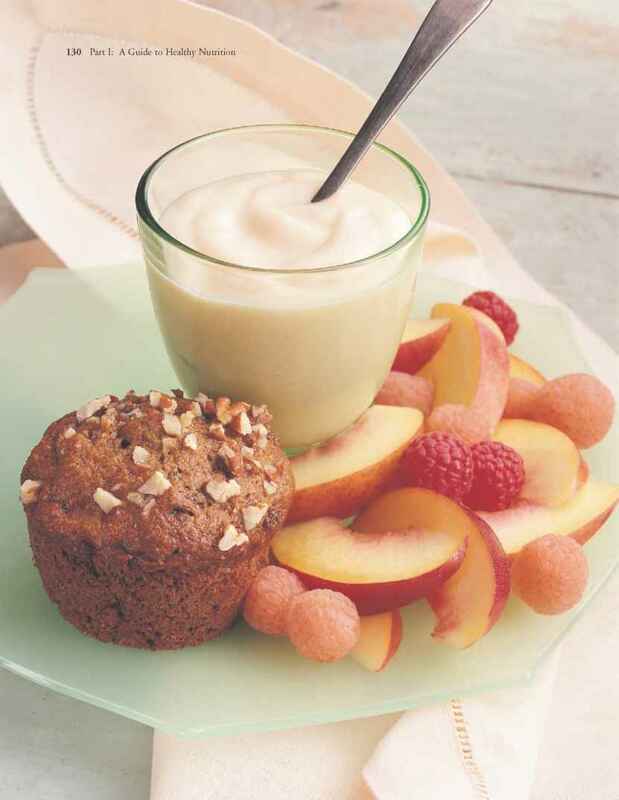 Use pureed fruit or applesauce to replace the fat in a 1:1 ratio. For example, use one-half cup of oil plus one-half cup of unsweetened applesauce (instead of 1 cup of oil). Eliminating 1 cup of oil or fat saves about 2,000 calories and 225 grams of fat. Another way to decrease fat and cholesterol is to substitute egg whites or egg substitute for a whole egg. 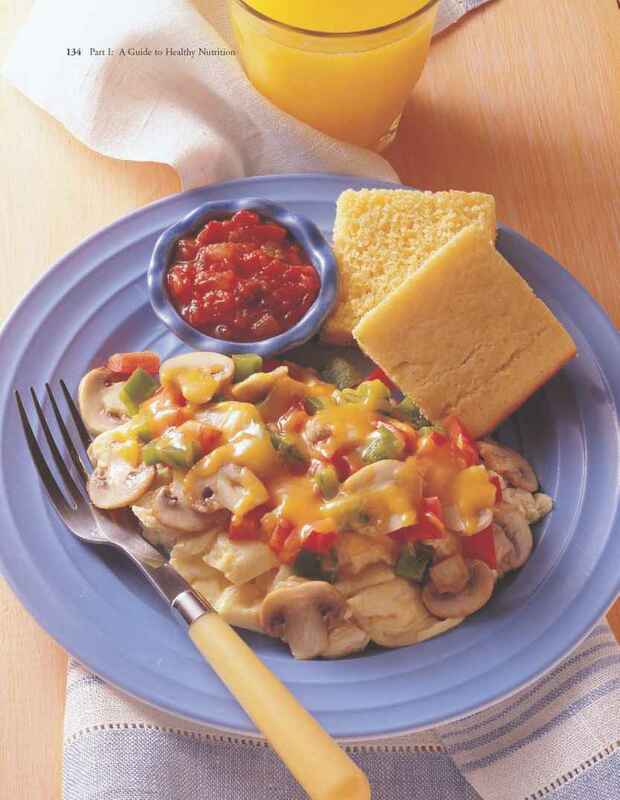 For every egg, use 2 egg whites or a quarter cup of egg substitute. With this replacement, approximately 5 grams of fat, 2 grams of saturated fat, 200 milligrams of cholesterol, and 60 calories are saved. Can an Ingredient Be Omitted? Determine whether any ingredients can be omitted. Sugar, fat, and salt are likely candidates because in many instances they are used mainly for appearance or by habit. To reduce sugar, omit candy coatings, sugary frostings, and syrups. Nuts, although nutritious, are high in fat and contribute significant calories. Additional condiments that add unwanted fat and calories include coconut, whipped cream, mayonnaise, butter, margarine, and sour cream. Pickles, catsup, olives, and mustard are low in calories. However, because these condiments are high in salt, persons who have high blood pressure or heart disease generally should limit their use. Can a Substitution Be Made? • Use sparingly: 1/4 teaspoon per pound of meat or pint of sauce. You can always add more. • When doubling a recipe, add only 50 percent more seasoning. • Crush or rub dry herbs between your fingers to enhance flavor before adding them to a recipe. • In long-cooking entrées such as stews, add herbs toward the end of the cooking time. • In chilled foods such as dips, salads, and dressings, add herbs several hours before serving. • For maximal freshness, purchase herbs in small quantities and store in airtight containers away from light and heat. served at the table. In most instances, success depends on patience and a bit of creativity. If one substitution does not yield the desired result, try again. Another substitute or a different amount of the same substitute may work better. Would Another Cooking Method Be Healthier? The choice of cooking technique is important. If the usual method of cooking uses fat, try grilling, broiling, braising, or roasting the food instead. Instead of deep-fat frying, try oven baking. French "fries" seasoned with chili powder or oregano are both tasty and low in fat when baked. Although stir "frying" can be a healthful cooking technique, use of generous amounts of oil negates some of the possible benefit. 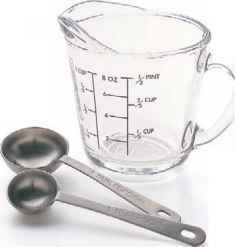 Always measure the oil to be used or, better yet, replace it with wine or a broth that adds flavor but little fat and only a few calories. Cooking food for the proper time (avoiding overcooking) not only makes it taste better but also preserves nutrients. Try these ideas for decreasing fat, sugar, and salt when preparing or eating foods. Braising—Food is browned, then cooked in a tightly covered pan in a small amount of liquid at low heat over a long period. Broiling—Food is placed beneath the heat source; basting may be needed. Grilling—Food is positioned above the heat source; basting may be needed. Microwaving—This is a quick way to cook food with little added liquid or fat. Poaching—Food is cooked in a liquid at the simmering point. 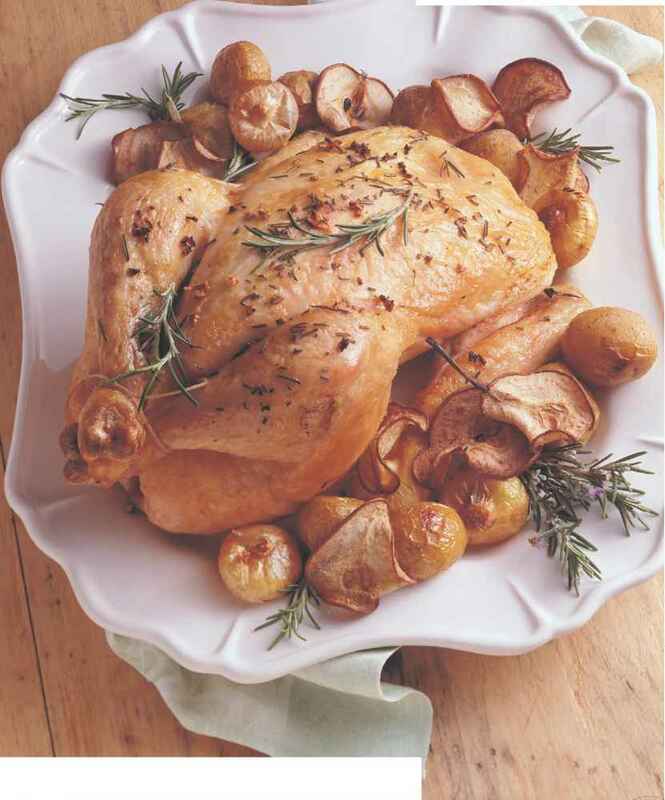 oven roasting—Food is cooked in an uncovered pan by the free circulation of dry air, until the exterior is well browned. Steaming—Food is placed on a rack in a basket above boiling liquid. Food should not touch the liquid. Stir frying—Small pieces of food are cooked over high heat and constantly stirred. Use wine, broth, or fruit juice as the liquid instead of the traditional oil. Marinating food adds flavor and does not have to add fat. Some tips for successful marinating include piercing large cuts of meat, poultry, or fish with a fork to help the marinade permeate the food. Always marinate food in a glass or ceramic dish in the refrigerator. Never place the food in a metal container. Most marinades feature an acid base that may react with metal and change the flavor. Finally, a food safety tip: reserve some of the marinade before you put meat in it. Marinade that has been in contact with raw meat should not be used to baste meat, poultry, or fish during the last 15 minutes of cooking. If you plan to use leftover marinade as a table sauce, it must be boiled for 5 minutes to eliminate bacteria. There is more that can be done once the food is out of the oven or off the stove. Skim the fat off pan juices, stews, and soups. Instead of topping vegetables with butter or margarine, sprinkle them with lemon juice or herbs. Remove any visible fat (and any skin from poultry) before serving. No special, expensive equipment is needed to cook healthful foods. A good set of non-stick pans, a skillet, a roasting pan, a baking sheet, measuring cups and spoons, and sharp knives are enough to get you started. Quality, durability, ease of use, and cost should be the primary considerations when outfitting a kitchen. Can the Amount of Fruits, Grains, and Vegetables in the Recipe Be Increased? Increasing the amount of vegetables, grains, and fruits in a recipe can both improve taste and increase the nutritional quality of the food. For example, when cooking a soup or stew, use three times as many vegetables (by measure) as meat. Add generous portions of mushrooms, tomatoes, broccoli, and green pepper to pizza. Make pizza even lower in fat and calories by omitting or decreasing the cheese. Alternatively, choose a lower-fat cheese, such as mozzarella (made from skim milk), and use less of it. If possible, eliminate the meat or add only a small amount of lean meat. If you are making your own crust, make it thin and use whole-grain flour. Pizza, if served with a salad and eaten in moderation, can be an enjoyable and nutritious meal. To get at least 5 servings of fruits and vegetables a day, add them to foods that do not typically include these ingredients. For example, add chopped pieces of fruit or vegetables to rice, add fruit toppings to toast or pancakes, or top meats with chopped vegetables. For each serving of meat (a serving is 2 to 3 ounces of meat), try to eat at least 1 serving each of fruit, vegetables, and grains. When possible, start your meal with a healthful salad. This often helps you decrease the amount of high-calorie food that you eat later in the meal. The more servings of grains, vegetables, or fruit, the better, because these are both filling and high in nutrients (see sidebar: Nutrition Boosters, page 129). Plan menus so that each meal complements what you plan to eat later in the day or what you have eaten earlier in the day. Include plant-based entrées as often as possible. 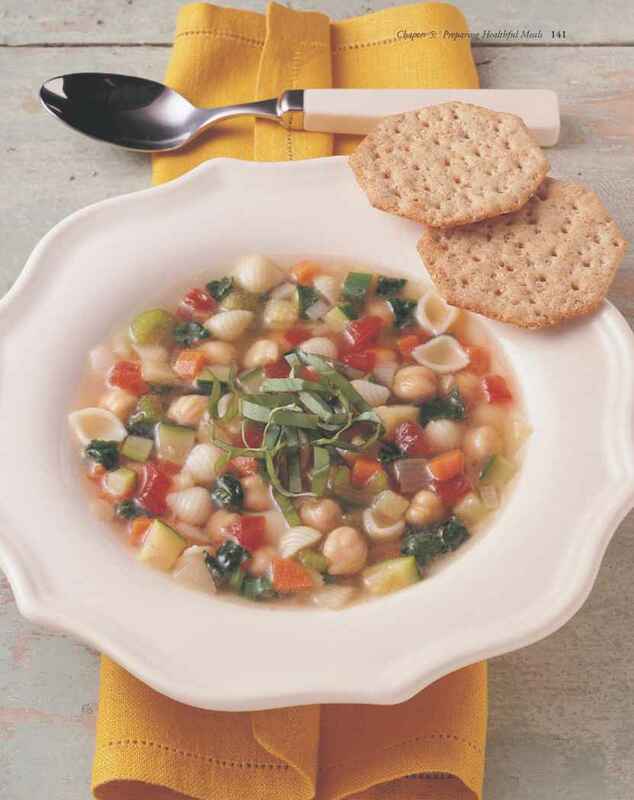 Examples that can result in satisfying meatless meals include pasta with marinara sauce and lots of vegetables, stir-fried vegetables with tofu over rice, or lentil soup with a side dish containing grains, beans, or vegetables. Plant-based entrées can be tasty, filling, and nutritious. When you choose to eat meat, fish, or poultry, remember that your goal is to eat 6 ounces or less per day. If you ate meat for lunch, appropriately decrease your dinner portion. Avoid red meats that contain a large amount of fat. Instead, emphasize poultry or fish. When you eat red meat, choose a "choice" grade and a cut from the loin or round, because these generally are the leanest types of meat. The skin on poultry holds in moisture and flavor during cooking. 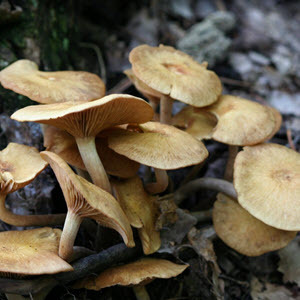 However, the skin is high in fat and calories. Contrary to popular belief, the skin does not need to be removed before cooking. There is minimal fat absorption if the skin is left on. 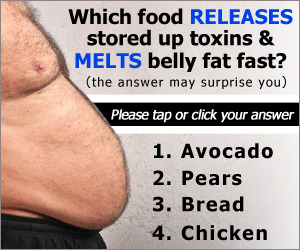 Just make sure to remove the skin before the poultry is eaten. Many fish are low in fat. Those that are not low in fat generally contain omega-3 fatty acids that may help prevent heart disease. However, remember, all fats are high in calories, so the less fat added during cooking, the better. Condiments and sauces can add nutrition and enhance flavor. Keep in mind, however, that some are high in fat, sodium, and calories (see Chapter 4, "On the Side," page 86). An example of a high-fat sauce is gravy over mashed potatoes. Instead, try sprinkling mashed potatoes with garlic or other herbs. When choosing a topping, look for a lower-fat alternative. If none are available, then use less of the original topping. 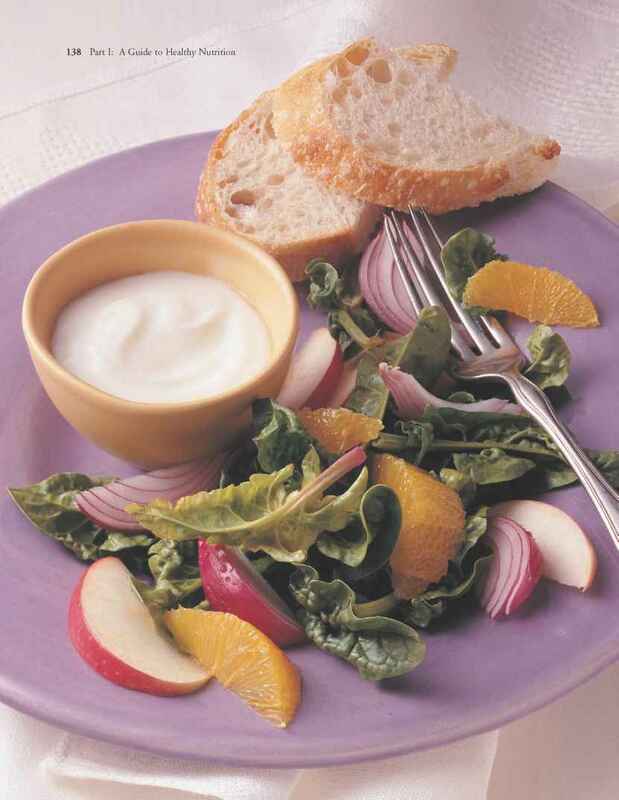 Sliced, chopped, or pureed vegetables can make a nourishing low-fat condiment. Fruits are a delicious complement to almost any meal. They can top meats, enrich salads, or be served for dessert. A dessert can be a pleasant end to a healthful meal. However, a dessert should not be an "extra." Be sure it is included in your overall meal plan. Make the dessert a bonus by emphasizing fruit, whole grains, and lower-fat items. 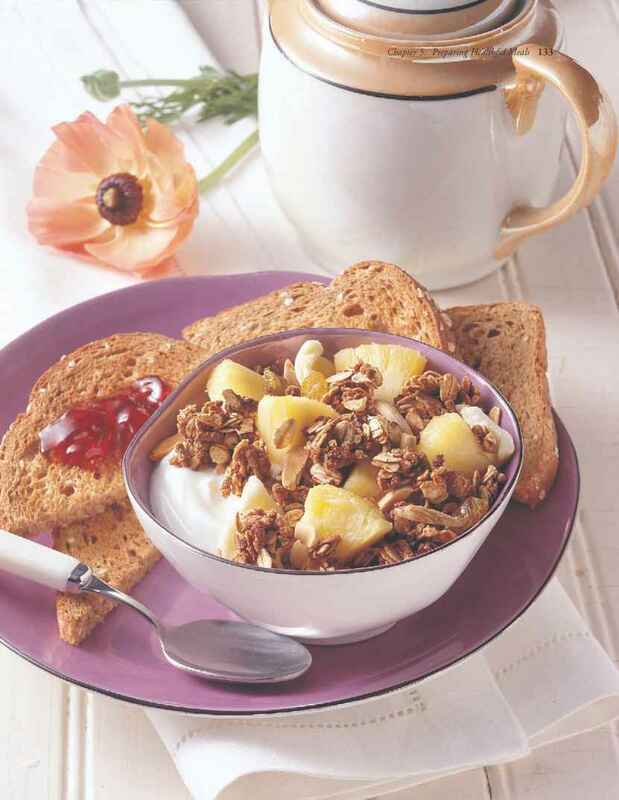 If you do not have a recipe that emphasizes fruits and whole grains, look for one that can be readily modified. Sorbets and low-fat frozen yogurts or ice creams are good choices. Even cookies, pies, cakes, and chocolates have their place. However, remember, because these desserts generally are high in fat and sugar, they are at the pinnacle of the Food Guide Pyramid. Therefore, they should be the exception rather than the rule. If you plan to eat a dessert, take a small portion. If you are preparing a dessert for a special occasion, make just enough to serve you and your guests. Leftover dessert is a powerful temptation. 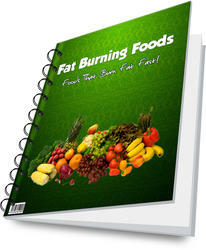 With a little thought and planning, you know what foods to emphasize and what foods to limit. You are ready to make a commitment to improve the way you and your family eat. Now it is time to put your plan into action. To help you get started, examples of "makeovers" for breakfast and noon and evening meals are shown on the following pages. There are many ways to help you get more fruits, vegetables, and grains in the foods you eat. Try these ideas. 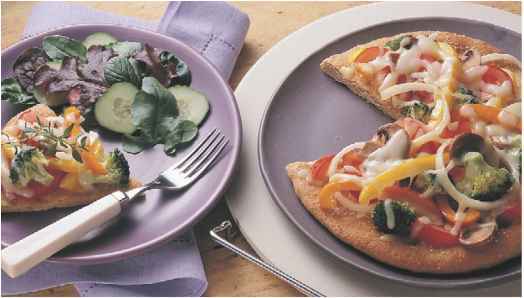 Pizza with less meat and cheese and more vegetable or fruit toppings is enjoyable and nutritious. You have learned how to select healthful foods, to modify recipes appropriately, and to make attractive and good-tasting meals. The final step is to ensure that the food you serve is safe to eat. Approximately 7 million cases of food poisoning are reported every year in the United States. Many other cases are mistaken for stomach flu or some other infection and therefore are never reported. Food poisoning can be a serious and potentially fatal illness. Fortunately, such severe cases are rare. Bacterial contamination of food can occur if food is handled improperly. Thus, food safety is of paramount importance. Kitchens are replete with chances for passing along the bacteria (germs) that cause food poisoning. It is the responsibility of the person preparing the meal to make certain that foods and utensils are washed properly. Unclean kitchen utensils can promote food poisoning by growing unwelcome bacteria (see sidebar: Sources of Bacteria, below). Sometimes in the rush to prepare meals, it is easy to overlook one of the simplest and most important rules in food preparation: wash your hands before handling any food. Bacteria tend to accumulate on your hands, especially around the cuticles and under the fingernails. To actually kill the bacteria, it would take water so hot that it would harm your skin. At least 10 seconds of vigorous rubbing with soap or detergent and warm water is required to rid your hands of germs. You also should wash your hands during meal preparation if they become contaminated by the food you are handling. Cross-contamination can lead to food poisoning. If uncooked food has been on a plate or cutting board, that plate or cutting board could transfer a potentially infectious agent to any other food that comes in contact with it. 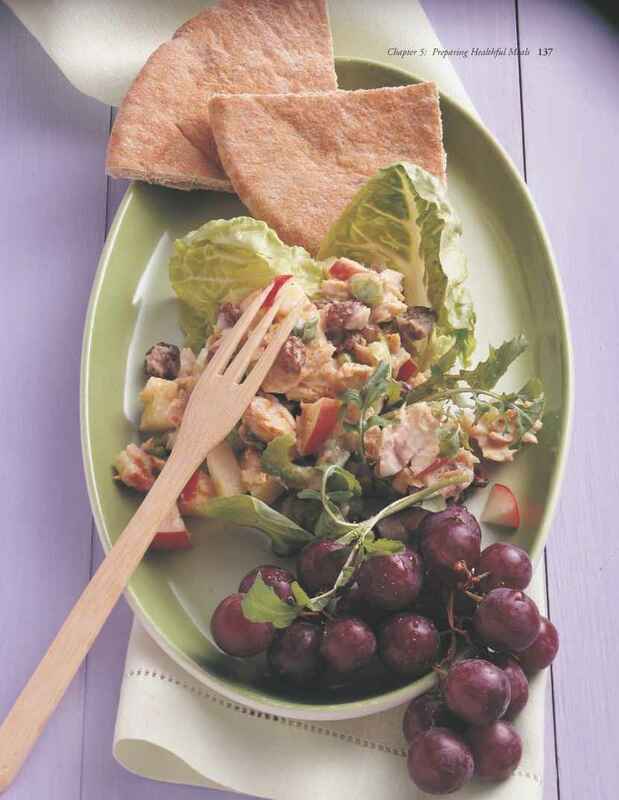 Therefore, always use separate utensils, plates, and cutting boards for raw and cooked foods. Food safety begins as soon as you purchase the food. Ideally, perishable foods should be promptly taken home and immediately refrigerated or frozen. However, if you need to make a stop before reaching home, plan to store meat, fish, poultry, and dairy products in a cooler on ice. Always observe the refrigeration recommendations on packaged foods. To decrease the total amount of bacteria found on raw chicken and other poultry, thoroughly rinse, inside and out, under cold water. After a complete rinse, use hot water and soap to wash out the sink. Before freezing meat, poultry, or fish, divide it into the portion size that you will need to prepare one meal. When you need to cool a food that you have cooked, quickly transfer it to a shallow container. Cover it and refrigerate it immediately. Bacteria thrive at temperatures between 40° and 140° Fahrenheit, potentially doubling in number every 20 to 30 minutes. Therefore, the most important food safety rule in the kitchen is: Keep hot foods hot and cold foods cold. *A simple cleaning solution that helps to keep bacteria in check is to mix 1 tablespoon of bleach to 1 gallon of water. Generously spray the surface and let it stand for several minutes. Rinse and dry with a clean towel. 1 or 2 days before it is to be used. For faster thawing, run cold water over the item or use a microwave for quick defrosting. Marinate poultry, seafood, and meat in the refrigerator. To play it safe, set some of the marinade aside (to use for basting or as a sauce at the table) before adding it to the raw meat. Avoid using the liquid that the raw meat has been marinating in for basting. If you do, discontinue basting at least 15 minutes before the meat is done so that the marinade can be heated to a high enough temperature to kill any bacteria that may be present. Do not use the leftover marinade as a sauce unless it has not come in contact with the raw meat or you have boiled it for at least 5 minutes. Always be sure to cook recipes at the appropriate temperature. Cooking foods to an internal temperature of at least 160° Fahrenheit kills most dangerous bacteria. Uncooked or undercooked meat can harbor pathogens such as the notorious E. coli bacteria (see sidebar: Cooking It Safe, this page). Using a slow cooker is a popular way of preparing soups, stews, roasts, and other hearty dishes. Because this device cooks at relatively low temperatures—compared with the oven or stovetop—it is vital to exercise safe cooking habits. For example, thaw meat thoroughly and cut it into small pieces. Use recipes that call for plenty of liquid. Bring to a boil quickly and then reduce heat to simmer. Do not overfill the cooker. Be sure to use a thermometer to make certain the temperature stays at 160° Fahrenheit or higher. After taking care to prepare and cook food as safely as possible, don't contaminate it while it is being served. Here are a few tips. Avoid letting cooked foods cool on the table. Do not allow foods that contain perishable ingredients (such as raw eggs, homemade sauces, eggnog, or homemade Caesar dressing) to remain at room temperature for longer than a few minutes. Once finished serving, always promptly place cooked or perishable foods in the refrigerator or freezer. At a picnic or party, keep cold foods on ice and hot foods properly heated. Dishes, serving bowls, or other items made of glazed lead-containing pottery can cause poisoning, particularly in young children. Make sure that the container that is used for cooking and serving is properly glazed (manufacture by a domestic pottery dealer should ensure this). 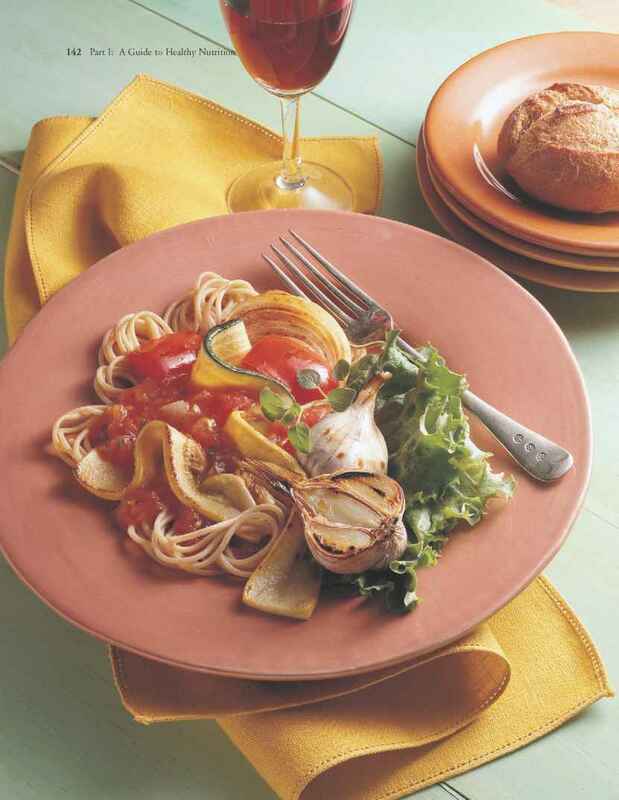 If in doubt, use the pottery for decoration rather than for cooking or serving food. If warm or hot food is headed for storage in the refrigerator or freezer, do not allow it to cool on the countertop. Place warm or hot food into a shallow pan to facilitate cooling and then put it directly into the refrigerator or freezer. If the quantity of food is large, distribute it in two or more containers to enable quicker cooling. When you have finished eating, thoroughly wash pots and pans, utensils, and all kitchen surfaces (counter, stove tops, and sink) with soap and hot water. Let cutting boards and utensils air dry. Wash or replace sponges and dish towels frequently. If you have an automatic dishwasher, it may be helpful to have two sponges so you can wash one with each load of dishes. With a little care, you can minimize the risk that you or others will develop a food-borne illness.